Time flies when you are having fun. I'm been testing out some photo frames I purchased from A time to stitch on the Janome MB-4. It's been lots of learning but fun. On the Janome embroidery machine, it comes with 10 fonts. 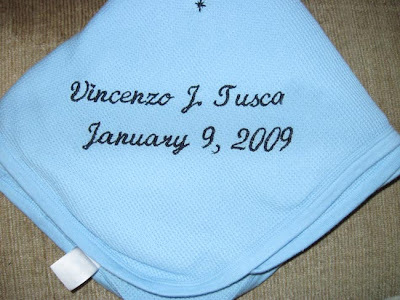 I ordered some baby blankets and finished my first embroidered name. I used wash away stabilizer but I'm not sure if I did it correctly. I placed it on the back and embroidered the name. Then I took a damp down towel to the stabilizer to remove. It came off, but left a large amount of sticky/stiff residue on the blanket. Here's what inspired this new embroidery hobby. 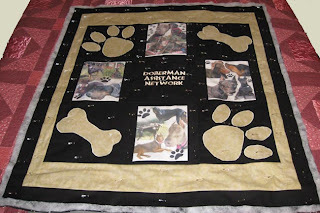 I was working on a donation quilt for the doberman assistance network which rescues and places dobermans. 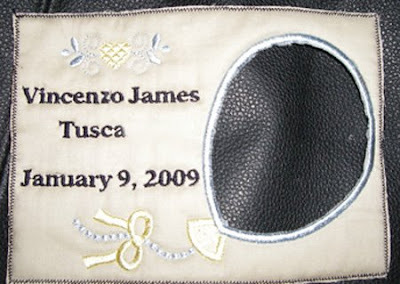 When I had my friend Rachel embroider the center block. Over the last week, I've finished all the pieces to place together the quilt top. It has applique, embroidery and photo collages. Hey Trish, just thought that I would drop a line and let you know that the Doberman quilt looks great! It sounds like you are having a great time with your MB4It's addictive isn't it?